After I mentioned I had asked the internet readership to help us choose a new vessel sink, the Guy announced he has a definite preference and that he is a Super Delegate and therefore gets two votes. I have a different choice of sink but as I threw it open I will of course abide by the majority's decision. He is concerned that I didn't give you a choice to state you think all four were horrible. So if you hate them all, have a better suggestion or have a reason why you favor one vessel sink over another send me a comment. Each of the above has at least one vote. 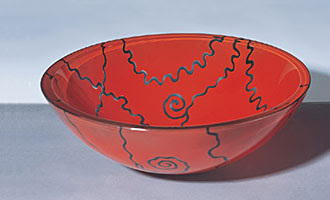 It seems no one is into the Red Spiral, are the swirls too distracting perhaps? To help us with the decision we visited Color Chart: Reinventing Color, 1950 to Today at the MoMA in Manhattan. It was a fabulous show, possibly the best I've seen there since they expanded MoMA, but we are no nearer reaching a concensus. More about the exhibition over here. 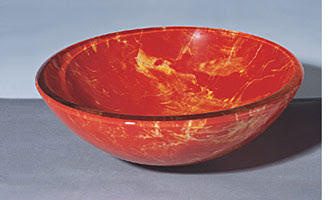 i like the red marble best. I LOVE the first sink (red and black). LOVE it. YUMMY! 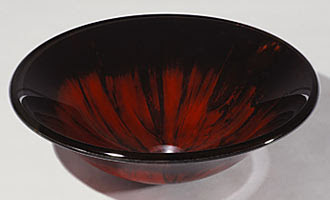 First choice... Red and Black. I really like the colors (but it does seem a little dark). 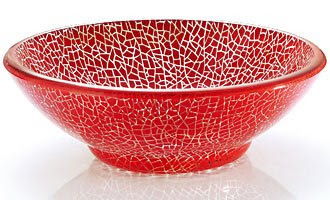 Second choice.... Red crackle. Looks upbeat and fun. With that said, I refer to my wife for decorative questions. I'd love to see it installed.